Mom and I usually go out of town for lunch, forgetting that our own hometown has quite a list of restaurants that we have yet to review. With the addition of Fall River Eats, a new food blog that features the city's best dining establishments, Mom and I felt that we needed to step up our game. She started thinking of places that had been recommended to her by family members. One name that she came up with was the Liberal Club, a large banquet hall/bar/restaurant that supposedly has great Portuguese food. I had been there once before, but since it was quite a long time ago and somewhat of a blur, we decided that this would be a perfect opportunity for us to do an official review of the place. 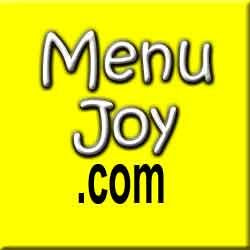 Located in the center of a residential area, the restaurant is hard to find if you do not know the city. Luckily for us, I knew just where it was and we pulled into the large parking area at just around 2:15 p.m. Since there is no entrance to the dining room at the front of the brick building, you have to park at the far left side - almost behind the restaurant - where you will see an arrow pointing toward the correct door. Once inside the small lobby, which had a list of specials hanging in the waiting area, we walked down the ramp and into the dining room. Paying attention to the "please wait to be seated" sign, we patiently waited until a friendly waitress - who we later learned was named Kris - came over and showed us to a table/banquette. She placed two plastic-covered menus in front of us and gave us a few minutes to look them over. Since there were so many things on the menu, I had trouble deciding what to get. When Kris returned, I had to ask her for a few more minutes so that I could make up my mind. Both Mom and I wanted to get a Portuguese dish, so when Kris returned, I chose the cacoula sandwich with red pepper ($6.95), and Mom chose the chourico and chip dinner ($7.95). Mom suggested that - if they offered it - I try a small cup of their kale soup. Luckily for me, they did ($2.95). After Kris retreated back to the kitchen, an older woman appeared and asked us what we would like to drink. We ordered two Diet Cokes, which were brought to us in cans along with two plastic cups of ice. We were asked to pay for the drinks right away ($2.50 for the two), which is something that I remembered from my previous visit. After I paid the woman and she went off to another table, I asked Mom if I should have tipped her. Neither of us knew! Oops. We need to brush up on our tipping etiquette. Both Mom and I were very impressed with the size of the menu at the Liberal Club. Mom was expecting a bar menu with a couple of options, but this was a fully operating restaurant complete with everything from appetizers to desserts. Appetizer choices include boneless buffalo wings and mozzarella sticks; soups ($2.95-4.95) include New England and Manhattan clam chowders, seafood bisque, and baked French onion; and salads include Caesar, garden, and chicken Caesar. 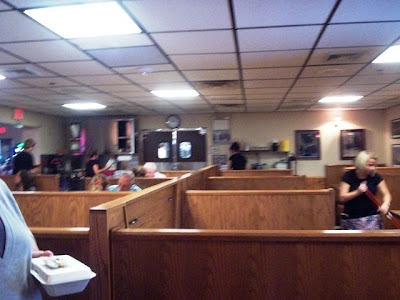 There was also a long list of specials and a list of various chicken, steak, and seafood dishes like the Bourbon steak tips, baked scrod, scrod casino, fish and chips, fried sole, and a fried clam plate. Other choices include the cacoula plate, chourico meat plate, shrimp Mozambique, chicken parmigiana, and spaghetti with marinara sauce. The prices were about average for a nice restaurant, although the seafood dishes ran a bit high (the clam plate was $20.95). This is probably because the market value of seafood is very high right now. However, where indicated, some dinners come with soup or salad, your choice of potato and vegetable, and rolls. You do get a lot for your money. Although we've never been in any of the fancy banquet rooms or the bar of the Liberal Club, Mom was quite pleased with the attractiveness of the dining room. In her mind, she was picturing a little dive with a couple of dinky looking tables. This was actually quite the opposite. 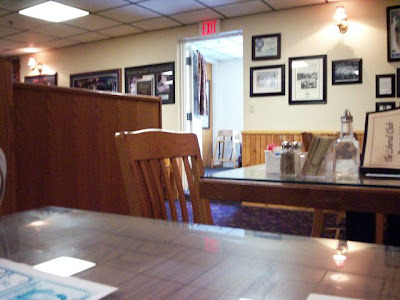 The beige dining room was decorated with several local photos and Red Sox memorabilia. Portuguese music played in the background while diners relaxed in very large, wooden booths. From afar, it almost looked like an area filled with cubicles. There were no table cloths, but there were place mats featuring local businesses on each table. Everything was very neat and clean, and the waitresses all seemed very attentive and friendly. I had a hard time getting a clear picture because of the overwhelming booths, but I was surprised at how many people could actually be seated comfortably in the small space. 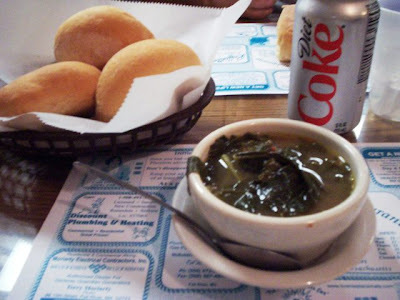 In a matter of seconds, my cup of kale soup arrived along with four fresh Portuguese rolls and butter in a basket. Not only were the rolls outstanding, but the kale soup was extremely tasty. It was served very hot and was filled with fresh kale, kidney beans, potatoes, roast meat, and chourico. I kept dunking my roll into the soup to ensure that I soaked up every drop. So what if I looked like a pig? I was enjoying myself. Mom also couldn't get enough of the rolls, which most likely come from one of the many Portuguese bakeries in the area. Boy, the service here is fast. I hadn't even finished my soup when I spotted Kris walking over with our plates of food. Both dishes looked and smelled amazing. She asked us if we would like a bottle of ketchup for our fries, and I said yes (Mom doesn't do ketchup). 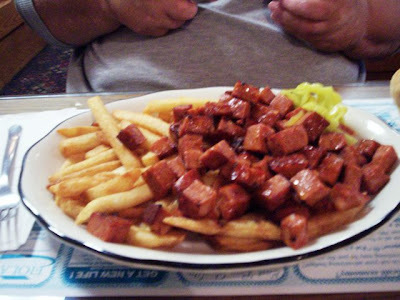 It seemed like there was about a pound of cubed chourico sitting on top of an equal amount of crispy fries on Mom's plate. She was very surprised and impressed by the portion size, especially since it was only $7.95. The dish was accompanied by some sliced banana peppers, which she quickly handed over to me since she's not a fan. Once she tasted the dish, she found that the chourico was lean, nicely spiced, and very well done. She even enjoyed the fries, which were served very hot - just like she likes them. There was so much food on the plate that Mom ended up taking half of it home to Dad, who thoroughly enjoyed it as well. 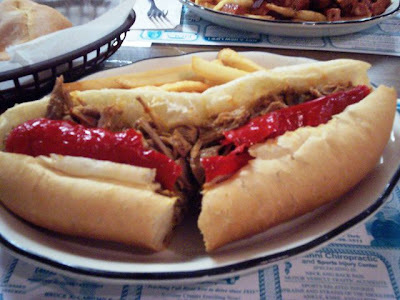 Portuguese cacoula (spelled several different ways) is nothing more than marinated, shredded pork. Stuffed into a large torpedo roll, my sandwich was fabulous. I threw Mom's banana peppers into my sub along with the large red pepper that was already laying across the top. The pork was tender, deliciously spiced, and surprisingly not messy to eat. There was so much meat that I thought the bread would eventually get soaked and I'd be wearing half of it. This never happened. Everything stayed together and, with the peppers, had a very spicy, terrific taste. The handful of fries that came with it was also very good and for $6.95, this large sandwich was definitely a steal. *Remember, we already paid for our drinks. We left $22.50 on the table for Kris, which included a 20% tip. Before leaving, Mom decided to check out the ladies' room, which was located right next to the dining room entrance. She said that the single unit was simple, but immaculate. 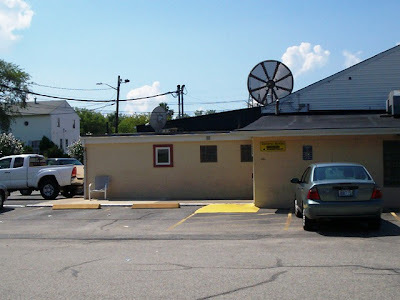 As we carried Mom's Styrofoam back to the car, we laughed at the fact that it had taken us years to visit a restaurant that the rest of the city is very familiar with. I'm almost positive that every Portuguese family in Fall River has had at least one wedding or birthday party in the banquet rooms, and it's no surprise because the food is outstanding. 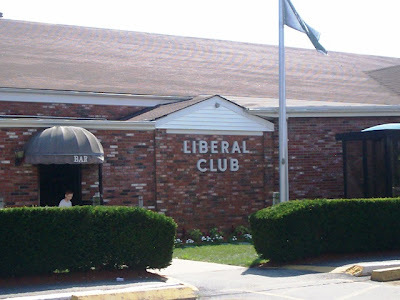 Mom has been full of great ideas lately, and I'm really glad that she suggested the Liberal Club. Her expectations were exceeded, and we will definitely be coming back again. The Liberal Club is open from 11 a.m. to 7 p.m. Tuesday and Wednesday, and 11 a.m. to 9 p.m. Thursday through Sunday. The restaurant is closed on Sunday and Monday.